The differences among individuals in a population. in one species lead to change in another species with which it interacts. A long relationship between two different species; see also mutualism, commensalism, parasitism. is a close and long-term interaction between two different species. An interaction between members of two species which benefits both; in strict terms, obligatory mutualism occurs when neither species can survive under natural conditions without the other. occurs when both species benefit from the interaction. 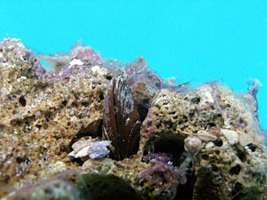 In the Red Sea, Date Mussels (Lithophaga simplex) are bivalves that live inside the Porous Star Coral (Astreopora myriophthalma). The mussels are completely encased by the skeleton of the coral with only the ends of their siphons reaching the surrounding seawater through a small hole. 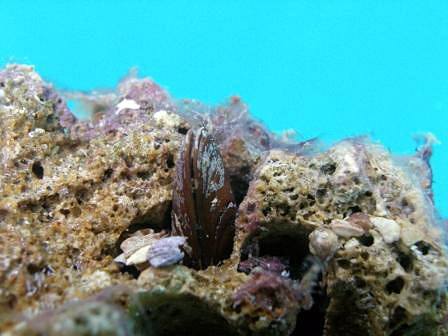 Researchers have discovered that the relationship is mutualistic with the bivalve gaining protection against predators and the coral receiving the ammonium produced as a by-product of the mussel's metabolism. 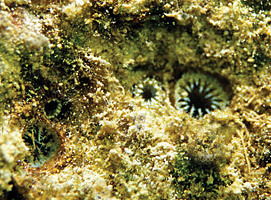 Ammonium is a rich source of nitrogen that is important for the survival of the coral colony. You can read the original research paper here. A type of symbiosis in which two (or more) individuals of unrelated species live in close proximity to one another, in which one member is unaffected by the relationship and the other benefits from it. occurs when one species benefits and the other is unaffected. 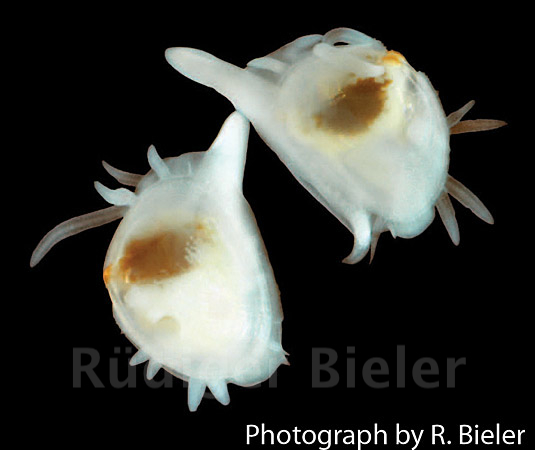 Yoyo clams (family Galeommatidae) are tiny bivalves that live in the mud burrows of mantis shrimps on sand flats in eastern Florida. 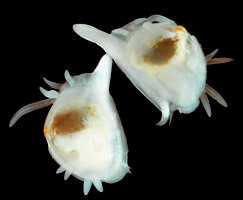 The clams benefit from the protection offered by the burrow, and have evolved very fragile, often internal, shells presumably because they no longer need robust shells to ward off predators. They also benefit from the feeding activities of the predatory shrimp, filtering small bits of fish and other food scraps from the water inside the burrow. The mantis shrimp is not affected by the presence of the small bivalves, and does not feed on them. A form of symbiosis in which one organism (the parasite) benefits at the expense of another organism of different species (the host). The association can also lead to the injury of the host. occurs when one species benefits and the other is harmed in some way. A huge specimen of Platyceramus platinus on display at the Denver Museum of Nature and Science in Denver, Colorado. 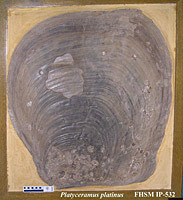 Inoceramids are an ancient family of extinct bivalves similar to living pearl oysters. They were massive organisms and are often called the “the pearl oysters of the Age of Dinosaurs.” What caused their extinction at the end of the Mesozoic probably involves many factors, but researchers have found evidence of shell deformities becoming very common just before the group disappeared from the fossil record. Some of the shell deformities look like small bubbles inside the shell and could have been formed if the oyster was releasing calcium carbonate to battle parasitic worms. The worms would have received nutrients from feeding on the inoceramid's waste but the inoceramid would have died and as a result the whole group became extinct. 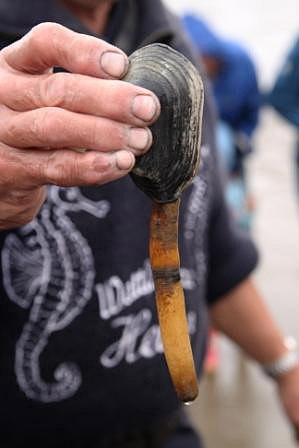 Introduced Zebra Mussels crowd onto the exposed end of a native freshwater pearl mussel, preventing it from opening to feed and respire, and ultimately smothering it. Competition occurs when two species are coevolving in the same territory or needing the same resources. Competition of this kind can lead to extinction of the lesser-competitive species. 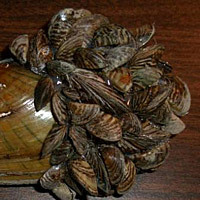 Invasive species, such as Zebra Mussels (Dreissena polymorpha), are perhaps the best examples of bivalve competitors. Zebra Mussels (native to southeastern Russia, and introduced into the American Great Lakes in 1988 from the discharge of ballast water from cargo ships) compete with native freshwater pearl mussels for food (organic particles filtered from the water) and living space. 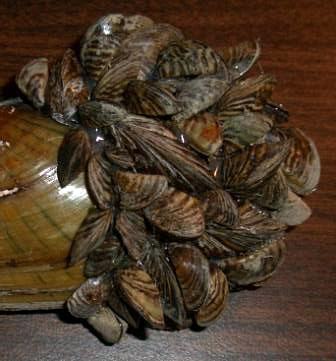 Zebra Mussels can also smother freshwater pearl mussels by attaching to their shells, preventing them from opening properly to feed and reproduce. A predator-prey “arms race” results from coevolution between a predator and its prey. As the prey species evolves more sophisticated adaptations to evade its predator, the predator in turn has to evolve more sophisticated adaptations to capture the prey. Posterior extensions (usually two) of the mantle through which water is directed in and out of the body, along with waste products and gametes of bivalves. (adj. siphonal), which allowed them to bury deeper in the sand or mud, using their siphons as a “snorkel” to the food- and oxygen-laden water. As predators later evolved the ability to burrow, bivalves developed longer siphons to bury deeper in the mud. Ozanne, C. R., & P. J. Harries. 2002. Role of predation and parasitism in the extinction of the inoceramid bivalves: an evaluation. Lethaia, 35(1): 1-19.